It’s a good year to visit St. Tropez. 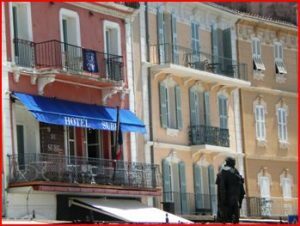 This Provencal mecca of the privileged has attracted the elite and those who want to rub their shoulders for years, often creating a harbor front too crowded to enjoy. With the economic climate affecting all pockets of society, St. Tropez is a bit quieter this year. The small sea-front village is still peopled by visitors speaking dozens of languages, but it’s more pleasurable to stroll along the narrow alley lanes and harbor front, still filled to capacity with gleaming yachts tied to the quay. One of the best kept secrets of the harbor front is the bar of the Hotel Sube, strategically situated behind the statue of the Bailly De Suffren , a local noble man who, in the 17th century, acquired great fame as a free-booter captain, terrorizing British merchant ships in the Indian Ocean. Once you have located the monument, take the covered alley behind it. Inside, after a few yards and on your right, you will find the entrance door for the Hotel Sube. Take a quick leap up the stairs, pass the reception and enter the bar. Memorabilia of ships and yachts greet you wherever the eye rests. Behind the counter a fabulous display of whiskeys and other fine spirits reflect on the great numbers of yacht races and world cruises that have been won or lost on the other side of the same counter. The patina is intact and figures like Ted Turner, Dennis Conner, John Bertrand, and countless anonymous sailors have had there debriefing in this mythical room. 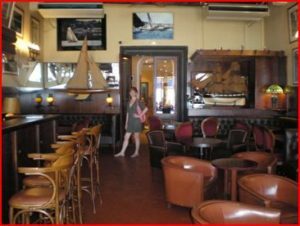 A fire place is usually lit in the winter and a hand full of small tables on the balcony can also be used to enjoy the harbor bustle from the shoulders of Monsieur de Suffren himself….